Companies will have to put up $300,000 to seek contract with utilities. Dong Energy, which has offshore wind farms like this one, is one of the companies interested in a possible bid on a recently released RFP. The bid to bring offshore wind to the ocean waters 15 miles south of Martha’s Vineyard moved ahead this week when the state’s major utilities issued a draft request for proposals (RFP) on purchasing power from proposed wind farms. Eversource, National Grid, and Unitil must by law buy power generated by renewables, as much as 1,600 megawatts over the next 10 years, as required by landmark 2016 legislation. This week’s start to bidding sets the initial phase of what will be a long process toward awarding contracts for up to 400 megawatts of electricity. Each bidder must pay a $300,000 nonrefundable fee to help defray the cost of evaluating the proposals, according to the bid documents. 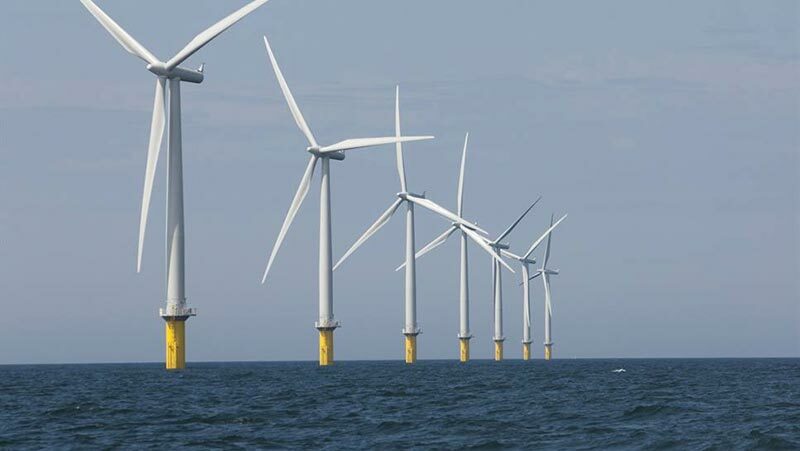 Eligible bidders must either be offshore wind developers or have offshore development rights. Three companies look to build offshore wind farms in the area. They include Vineyard Wind, Deepwater Wind, and Bay State Wind, a collaboration between Danish company DONG Energy and Eversource. The bids will be reviewed and contracts awarded under the supervision of the state Department of Public Utilities. A final RFP is expected to be issued June 30, and the deadline to submit complete proposals will be Dec. 20. A final contract should be submitted for DPU approval by Nov. 1, 2018. Potential bidders are required to be operating before Jan. 1, 2027. Participation by Rhode Island and Connecticut companies will be considered “if such participation has positive or neutral impact on Massachusetts ratepayers,” according to the bid documents. The bid process also requests that the companies contemplate two different ways for the electricity to be transmitted from the wind farms to the shore — one that has them building their own transmission lines, and another that has them sharing a line with other wind farms.